Great Britain Cabinet Office. (2008). London: HM Treasury. 13-ISBN 9781845325404/10-ISBN 1845325400; [http://www.worldcat.org/title/managing-the-global-economy-through-turbulent-times/oclc/428643726 OCLC 428643726Managing the Global Economy Through Turbulent Times. ^ Croft, Adrian. "London's ExCel Centre chosen as venue for G20 summit," Reuters (UK). 6 February 2009. Retrieved 7 April 2011. ^ "UK to host G20 financial summit," Number 10, Prime Minister's office (UK). 26 November 2008. Retrieved 7 April 2011. ^ Flitton, Daniel. "Australia may struggle to find a seat at a future economic table," The Age (Australia). 1 April 2009. Retrieved 7 April 2011. ^ a b MacAskill, Ewen; Davies, Nick (16 June 2013). "GCHQ intercepted foreign politicians' communications at G20 summit". The Guardian (London). ^ a b c d e f Great Britain Cabinet Office. (2008). p. 7Managing the global economy through turbulent times, . Retrieved 7 April 2011. ^ "Berlin, une étape importante avant Londres" ("An important step before London"). 7 sur 7 (Belgium). 22 February 2002. Retrieved 7 April 2011. ^ "Staatspräsident Sarkozy beim G20-Vorbereitungstreffen in Berlin: Wir müssen ehrgeizige und glaubwürdige Maßnahmen vorschlage" ("President Sarkozy at the G-20 preparatory meeting in Berlin, we must propose ambitious and credible measures"). Embassy of France in Germany. 24 February 2009. Retrieved 7 April 2011. 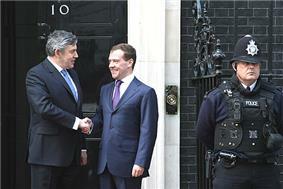 ^ "Gordon Brown takes pre-G20 tour to Brazil". The Daily Telegraph (London). 26 March 2009. Retrieved 29 March 2010. ^ "Brown to urge G20 to fight protectionists". Agence France-Presse. Retrieved 1 April 2009. ^ "Topolanek's criticisms of Obama's policies could sour EU-US relations". The Irish Times. 26 March 2009. Retrieved 1 April 2009. ^ Watt, Nicholas (1 April 2009). "G20: Sarkozy's empty-chair threat shows EU fails to realise times have changed". The Guardian (London). Retrieved 29 March 2010. ^ Bohan, Caren (1 April 2009). "UPDATE 1-Obama plays down G20 splits, seeks consensus". Reuters. Archived from the original on 5 April 2009. Retrieved 1 April 2009. ^ "France and Germany united at G20". BBC News. 1 April 2009. Archived from the original on 4 April 2009. Retrieved 2 April 2009. ^ John Hooper in Rome (6 April 2009). "ACTUAL ARTICLE TITLE BELONGS HERE!". The Guardian (London). Retrieved 27 June 2010. ^ Singh, Anita (1 April 2009). "ACTUAL ARTICLE TITLE BELONGS HERE!". The Daily Telegraph (London). Archived from the original on 5 June 2010. Retrieved 27 June 2010. ^ Rana, Pradumna B. "How can Asia strengthen its voice at G-20?" The Korea Times. 6 July 2010; excerpt, "Under the present G-20 practice of inviting representatives of regional groupings, the ASEAN chair and the ASEAN secretary general participated at the London, Pittsburgh, and Toronto summits; "Thai PM warns of over-ambitious G20 summit," Agence France-Presse (AGF). 2 April 2009. ^ "G20 summit: security operation launched". The Daily Telegraph (London). 28 March 2009. Retrieved 27 June 2010. ^ Dodd, Vikram. Ian Tomlinson death: IPCC takes over inquiry from G20 protests police force, The Guardian, 8 April 2009. ^ "Ian Tomlinson second postmortem: coroner and family statements". The Guardian (London). 18 April 2009. Archived from the original on 20 April 2009. Retrieved 18 April 2009. ^ Parliament (UK): Townsend, Ian. 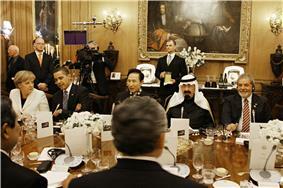 "G20 & the November 2010 Seoul summit" (SN/EP/5028), 19 October 2010. Retrieved 7 April 2011; excerpt, "Today, we designated the G-20 as the premier forum for our international economic cooperation" citing "Pittsburgh G20 Leaders’ summit communiqué," ¶50 29 September 2009. Retrieved 2011-04-07; excerpt, "Today, we designated the G-20 as the premier forum for our international economic co-operation. We have asked our representatives to report back at the next meeting with recommendations on how to maximise the effectiveness of our co-operation. We agreed to have a G-20 Summit in Canada in June 2010, and in Korea in November 2010. We expect to meet annually thereafter, and will meet in France in 2011. ^ "France is threatening G20 walkout," BBC. 31 March 2009. Retrieved 7 April 2011. ^ "G20 leaders seal $1tn global deal". BBC. 2 April 2009. Archived from the original on 3 April 2009. Retrieved 3 April 2009. ^ "G20 agrees $250 billion trade financing deal". Reuters. 2 April 2009. Archived from the original on 8 April 2009. Retrieved 3 April 2009. ^ "G20: What a laugh!". Greaenpeace.org. 1 April 2009. Archived from the original on 25 July 2010. Retrieved 7 August 2013. ^ Monbiot, George (2 April 2009). "G20 forgets the environment – Climate breakdown, peak oil and resource depletion all dwarf the financial crisis in financial and humanitarian terms". The Guardian (London). Archived from the original on 6 April 2009. Retrieved 8 April 2009. ^ "G-20 Shapes New World Order With Lesser Role for U.S., Markets". Bloomberg L.P. 2 April 2009. Retrieved 3 April 2009. ^ "China and the G20: China takes centre stage | The Economist". 31 March 2009. Archived from the original on 1 August 2009. Retrieved 31 July 2009. ^ Logged in as click here to log out (26 March 2009). "ACTUAL ARTICLE TITLE BELONGS HERE!". The Guardian (London). Retrieved 27 June 2010. ^ "ACTUAL ARTICLE TITLE BELONGS HERE!". Financial Times. 8 April 2009. Retrieved 27 June 2010. The influence of China was very apparent during the G20 with some commentators saying that the G20 was more like a G2. One of the general agreements at the London Summit is that there needs to be more government regulations over businesses, and there was a perception that the US would no longer be as dominant as it has been previously. Commenting on the summit, Robert Hormats, vice-chairman of Goldman Sachs International, said "The U.S. is becoming less dominant while other nations are gaining influence." Despite calls for a green new deal from Greenpeace and others and general political hype regarding environmental concerns, none of the US$1.1 trillion stimulus package was allocated for environmental investment, and no other environmental agreements were made. An agreement was also reached to attempt to bring wider global regulation of hedge funds and credit-rating agencies, a common approach to cleaning up bank toxic assets. The G-20 leaders also agreed to establish a financial stability forum working with the IMF to ensure wider global co-operation and to provide an early-warning system for future financial crises. US$100 billion in commitments for the multilateral development banks to lend to poor countries. The London summit was a preliminary step in the process through which the G-20 evolved to become "the premier forum for discussing, planning and monitoring international economic co-operation". 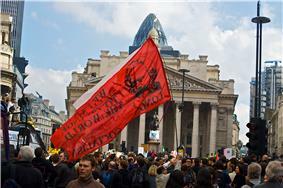 Ian Tomlinson, a newsagent in the City of London, died within a police cordon of the G-20 Meltdown protest near the Bank of England. Initially the City of London Police denied that any incident with the police had occurred. However video, photographic and eyewitness evidence was published in the media, and the Independent Police Complaints Commission (IPCC) confirmed that Tomlinson had been pushed back by police officers minutes before he collapsed and died of a heart attack. Further allegations that Tomlinson had been hit with a baton were supported when additional video footage became public. The IPCC then later ordered a second post mortem and an independent criminal inquiry, with the second post mortem finding that although "there is evidence of coronary atherosclerosis" it was "unlikely to have contributed to the cause of death" and that "the cause of death was abdominal haemorrhage". The summit became the focus of protests from a number of disparate groups over various long standing and topical issues. These ranged from disquiet over economic policy, anger at the banking system and bankers remuneration and bonuses, the continued war on terror and concerns over climate change. Although the majority of the protests and protestors were peaceful, instances of violence and criminal damage led to the use of kettling to contain protestors. In June 2013 The Guardian revealed that the intelligence agency of the British government, Government Communications Headquarters (GCHQ) spied on foreign politicians visiting the summit by intercepting phonecalls, emails and monitoring computers, in some cases even ongoing after the summit via keyloggers that had been installed during the summit. The security operation, Operation Glencoe headed by Commander Bob Broadhurst, was projected to cost £7.2 million. Six police forces were used during the operation: the Metropolitan Police, the City of London Police, British Transport Police and the forces of Essex Police, Sussex Police and Bedfordshire Police. Furthermore some units from the Ministry of Defence Police have been used. It is the highest security expenditure in British history. The following participants of the London summit include the core members of the G-20 major economies, which comprises 19 countries and the European Union which is represented by its two governing bodies, the European Council and the European Commission, as well as other nations and regional organisations invited to take part. The summit proper began on the morning of 2 April and took place at the Excel Centre in Custom House, east London. On the evening of 1 April the leaders attended a reception at Buckingham Palace hosted by Elizabeth II. During a photograph she lightly rebuked the Italian Prime Minister Silvio Berlusconi for shouting too loudly in an effort to attract the attention of President Obama. The story was featured heavily in the Italian media, and was used by opponents to lambast Berlusconi. After the palace reception, the leaders dined at 10 Downing Street where the food was cooked by Jamie Oliver. G-20 leaders began gathering in London on 1 April 2009. Before leaving for the London Summit, French President Nicolas Sarkozy suggested that if a meaningful deal was not agreed France would walk out of the summit echoing the "empty chair" gesture of then-French President Charles de Gaulle in 1965. At a joint press conference in London, Brown and Obama said that suggestions of a rift were exaggerated. Sarkozy attended a separate press conference with Merkel in which both repeated calls for the summit to agree on more stringent regulation of financial markets and restated their firm opposition to further financial stimulus packages. Leaders of the G-20 countries present at the London Summit (taken before the proceedings on 2 April 2009). In the weeks leading up to the London Summit, there had been a growing difference of opinions on the question of implementing further fiscal stimulus. The British and the American leaderships were in favour of another round of stimulus packages to try to stimulate the global economy, while the French and German leaderships remained strongly opposed to such measures because of the increased levels of debt which this would cause. On 26 March 2009 the Czech Prime Minister Mirek Topolanek strongly criticised the economic expansion policies of US President Barack Obama. In the weeks before the London Summit, UK Prime Minister Gordon Brown visited several countries on three continents to try to secure backing for his goals at the London Summit. During the trip Brown was forced to re-clarify his position on fiscal stimulus after criticism from the Governor of the Bank of England. While speaking at the European Parliament in Strasbourg, France, he was challenged by a Member of the European Parliament over his spending plans. He also visited the US, Brazil, Argentina and Chile. He strongly attacked protectionism saying "One of the messages that must come from next week's summit is that we will reject protectionist countries, we will monitor those countries and name and shame if necessary countries that are not following free trade practices". To strengthen the financial system, the participants proposed to regulate appropriately all important financial institutions, to register all hedge funds or their managers and to force them to provide appropriate information as to the risks they take. They proposed to implement regulation to prevent the off-balance-sheet vehicles; credit-derivatives market; and non-cooperative territories. The members also committed themselves to maintain the supply of credit by providing more liquidity and recapitalising the banking system, and to implement rapidly the stimulus plans. As for central bankers, they pledged to maintain low-rates policies as long as necessary. Finally, the leaders decided to help emerging and developing countries, through a strengthening of the IMF. 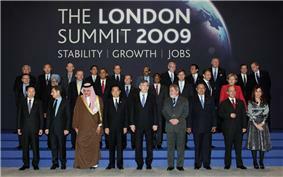 Finance ministers and central bankers of the G-20 met in Horsham on 14 March 2009 to prepare for the London Summit. To restore global growth as quickly as possible, the participants decided to approve coordinated and decisive actions to stimulate demand and employment. They also pledged to fight against all forms of protectionism and to maintain trade and foreign investments. The leaders agreed that markets, financial institutions and the wide range of financial assets they create, and hedge funds should be subject to appropriate control. In addition, they have called for effective sanctions against tax havens. They also agreed to impose sanctions against countries that intend to undermine their work. Finally, they advocated the doubling of funds available to the IMF. Leaders of the four Chancellor Angela Merkel. Leaders of the member countries began to prepare for the London Summit months before the effective date, notably with two official meetings dedicated to that preparation, one held in Berlin, Germany, on 22 February 2009 for European leaders, and another in Horsham, Sussex, United Kingdom, on 14 March 2009 for Finance Ministers. As hosts, the British Treasury produced an extended agenda pamphlet proposing the issues to be addressed at the London Summit. The explicit goals was "to start the process of reform so as to manage globalisation as a force for good in the medium term." It was revealed in June 2013 that GCHQ, the intelligence agency of the British government, had intercepted phone calls and monitored computers used by foreign delegates at the summit. Their actions were sanctioned by the British government and intelligence was passed to British government ministers. The policing tactics at the event raised some controversy, particularly over the death of Ian Tomlinson.